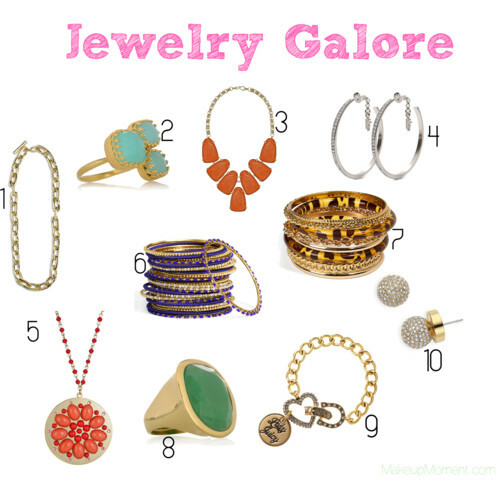 Today I want to share with you all a few jewelry items that are currently on my wishlist. A girl can never have enough accessories, and these pieces are so fun. Check it out! 1. Vince Camuto Toggle Link Gold Necklace ($89.99)-How fun is this chunky, link necklace? The link structure is so simple, but it can really add a tough edge to an outfit. 2. Kevia 22-Karat Gold-Pleated Cluster Ring ($76.00)- I love the aqua stones on this ring. So pretty! 3. Kendra Scott Harlow Statement Necklace ($195.00)- This is such a fabulous piece. I think this necklace is one that works for either day, or night. This necklace comes in other fun colors as well. 4. Folli Follie Match n' Dazzle Sterling Silver & Smoky Grey Crystal Earrings ($65.00)- I can never get enough of hoop earrings. They compliment any outfit, and the hoop style is one that lasts forever. 5. Roberta Chiarella La Luna Coral Necklace ($25.00)- I absolutely love the bright, coral and pink stones. This makes for a great piece that can be worn everyday, and one that will compliment many outfits. 6. Cara Accessories Mix Media Bangles, Set of 24 ($58.00)- Bangles are another one of my accessory staples. I especially love stacked ones, like these. 7. R.J. Graziano Gold Bangle Set ($50.00)- I love the gold and brown color schemes of these bangles. These would definitely add a fun, and fierce edge to an evening outfit. 8. Kenneth Jay Lane 22-Karat Gold-Pleated Resin Ring ($75.00)- The green stone sure is a stunner. I love how the colors green and gold look together, very chic. 10. Michael Kors Pave Ball Stud Earrings ($65.00)- I love jewelry that shines, and these crystal studs are no exception. The round ball shape is the perfect twist to your usual classic studs. Gorgeous! What accessories are you all craving for? Let me know in the comments section! you're right. a girl can NEVER have too much accessories! those blue bangles look fun. Hey, Hun! Thanks so much for keeping up with the site! :) I hope you enjoy it.